As a parent you’ll soon realize that translating the importance of health to your children requires a bit of creative marketing. To begin this new lifestyle, you must first explain the meaning of lean, so your child can understand the concept of being fit and healthy. You’ll need to talk openly with your child about making healthy changes. Together, you’ll have to identify your child’s personal challenges – specifically lifestyle choices that need changing. Being lean means having just the right amount of body fat for your body type. 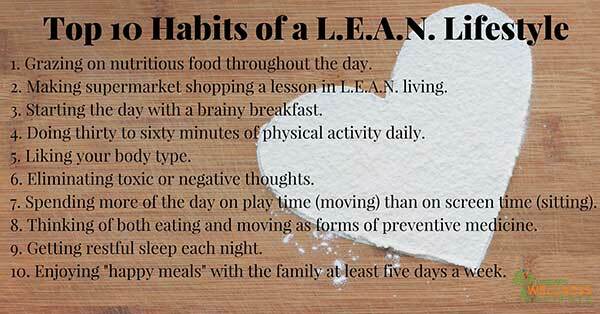 Becoming lean involves not only trimming unneeded and unhealthy fat from a child’s body, but also aims at breaking unhealthy lifestyle habits that interfere with the mental and physical health of your child. Being L.E.A.N. involves a child’s Lifestyle, Exercise, Attitude and Nutrition and will guide your child down the path of health and achieve their optimal health. Be sure your child understands that L.E.A.N. does not mean “skinny” or “thin”. Being thin or skinny does not always mean being healthy. In fact, a thin child may have poor eating habits, depressed immunity, and low energy, and she may not have a health ration of muscle to fat. Being L.E.A.N. is about being strong and happy. Remember that a child equates being different with being less. Because of the slim appearance of models and actors in the media, children (especially girls) can grow up thinking that being thin is cool. Be sure your child understands that no one body type is better than another. Naturally big kids can be as happy, healthy and strong as naturally small kids.L.E.A.N. just means achieving the right balance for you child’s body. A parent is like a gardener. Your job is not to control, but rather to shape your children’s choices. You can’t control the color of the flower or the time of the year it blooms, yet you can pick the weeds and prune the plants so that they blossom more beautifully. Each day with your child is like caring for a garden. What do you water, what do you weed, and what do you prune? By pruning we mean weeding out unhealthy lifestyle choices that keep you from getting lean. To be a good parent for your child, you need to remember to admit your mistakes. It’s essential to the success of L.E.A.N. living to remember that being L.E.A.N. doesn’t mean being perfect. If you’ve made an unhealthy choice and suffered the consequences, let your children know: “I got so busy at work, I ate a lot of junk food, and now I feel terrible!” You might even find your child advising you to be more careful in the future, and to keep a healthy snack on hand for those over-busy days. Forgiveness breeds success. Children expect adults to be adults. In reading the journals kept by children in the L.E.A.N. Kids program in our pediatric practice, I was amazed to see how many children wrote that they felt parent’s “didn’t care” when they let their children eat junk food. Because kids naturally choose food by taste and advertising, they rely on their parents to show their love by saying no to junk food when kids are unwilling to say no themselves. How willingly your child adapts to the changes in their lives depends not only on how deep-seated those unhealthy habits were in the first place but also on how your child perceives your passion for raising a L.E.A.N. family. Counter the “But Mom!” protests with “Because Mom cares!” message. What should you say when your child protests, “Why can’t I drink colas?” Your comeback could be, “Because I love you, I’m not going to let you pollute your body with that junk.” Kids expect an answer like that, and it reassures them that you love them. If you child spends a lot of time in the care of a sub, such as a babysitter or grandparent, you will need to instruct the sitter to support your L.E.A.N. lifestyle. Be clear and specific about the lean food you want your child to eat and the exercise you want your child to get.